JERICHO WALK 2018 FOR illegal RAVI RAGBIR – NO DEPORTATION | the "silent" majority no more! January 29, 2018. Outside NYC Federal Plaza. Ravi Ragbir, 43, was arrested Jan. 11, 2018 during a scheduled appointment with federal officials. 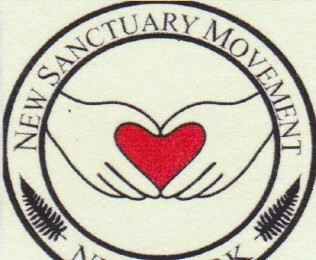 Ragbir worked as the head of the New Sanctuary Coalition, an advocacy group assisting people facing detention and deportation. I covered the Jericho Walk previously in 2011. Led by Ragbir they marched ’round and ’round the Federal Building – SEVEN times – as in the Walls of Jericho and looking like Fascisti every time they paused to do their HEIL salute. (picture from 2011 walk). In 2011, Ravi Ragbir (lower left in screen grab) spoke defiantly about being in the U.S. ILLEGALLY. Now, in 2018, under arrest and finally facing deportation, his Sanctuary Movement cohorts walked the Jericho Walk, sans Ragbir, around the Fed Building . SILENTLY reciting the Jericho Prayer to show solidarity with their “immigrant brothers and sisters. The JDL was there,too, in support of American Immigration Law. (video is of 2018 walk). After an older woman accused them of being “uneducated Trump Voters” (starting at 3:20) another malcontent (an older fellow in blue hoodie) was VERY vocal (not silent at all) as he tediously taunted with, “Fake News. Yes, Fox Fake News. Believe your alternative facts … Babies don’t break laws … Keep America WHITE Again“. Then there was the press. THEIR press. Eager to record this sacred gathering in support of DACA. One familiar photographer, Sandi Bachom, got her 15 minutes last year when she went AGAINST Mayor de Blasio’s failed attempt at shutting down the Central Park Hansom Cabs. She got that one right. ONE. The rest of the time she’s out cheer-leading for every Hard Left campaign she can cover. Today she should have just filmed – instead of her unfortunate attempts at ‘gotcha’ reporting (in the video at 1:31) : “Make America Great Again? Getting rid of all immigrants. Who told you this, Donald Trump? Where’d ja read that, on Brietbart? Where did you first hear about it (Ragbir) I never heard about it til last week ….Where’d ja hear about it? Ja hear about it on Info wars? Alex Jones? You know what that is?” Getting NO where with such embarrassing questions, she slank away with a “thank you”. Meanwhile, the JDL held their ground while quietly protesting as the Jericho protestors walked 7 times around the building. Other than the bad-players in the walk, it was a very quiet event. A federal judge ordered immigration activist Ravi Ragbir be released from custody on Monday, granting him a temporary reprieve from deportation to his native Trinidad and Tobago. In a seven-page decision, Manhattan Federal Court Judge Katherine Forrest wrote that Immigration and Customs Enforcement agents had violated Ragbir’s rights to due process. 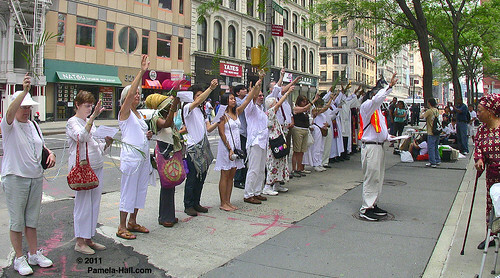 “The court finds that when this country allowed (Ragbir) to become a part of our community fabric, allowed him to build a life with and among us and to enjoy the liberties and freedom that come with that, it committed itself to allowance of an orderly departure when the time came, and it committed itself to avoidance of unnecessary cruelty when the time came,” Forrest wrote. Encouraged by Mayor de Blasios’s Sanctuary City Movement, this Manhattan Federal Court Judge ignored U.S. Immigration Law, supporting those who have no respect for the Rule of Law. Anarchy? Is that the ticket? This entry was posted in current events and tagged deportation, illegal immigrants, jericho walk, NYC, ravi ragbir, sanctuary cities. Bookmark the permalink.